Details about the english edition will be announced soon. Ulrik Imtiaz Rolfsen is a Norwegian filmmaker and writer. With feature film Izzat (2005) and TV-serial TAXI (2011), he has become an important political and artistic voice in Norway. He has also directed feature films Varg Veum – Bitter Flowers (2007), The Last Joint Venture (2008), and is an active newspaper columnist. Jafri Jafri is kept busy with the tedious task of investigating a small oil company’s accountings when he receives a phone call from a mysterious whistle blower. Even if it means lying to his boss, it may be the break he’s been waiting for. At home he has a hard time, being jealous of his partner Anne, whom he suspects of having an affair with one of her colleagues. 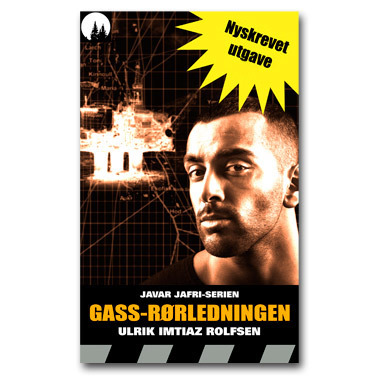 Intrigued by the whistle blower Javar begins pursuit of oil company North Oil’s shadowy owners. Their unscrupulous plans will kill hundreds of people and bring an end to Norway’s natural gas export. And soon is Javar Jafri on top of the death list. A thick yellow haze hung over the landscape, and waves of dust rippled over the fields. He was sitting on his knees squinting at the huge contraption towering above him. A bottle of water was thrust up to his mouth. He drank greedily. But before he had had enough, they snatched the bottle out of his reach. He clenched his fists and struggled to get loose from the ropes so that he could grab the water bottle back. But his hands stayed behind his back. His mouth was forced open, and the strip of cloth that had covered his eyes was tied tightly, like a bit. He could taste the dried blood and pus from his infected eye against his tongue, which would no longer fit in his mouth. Then he was kicked so hard in the back that he fell. Everything went black. He woke up as he was being lifted high in the air. Four men were carrying him. They were breathing heavily. He heard water buffalo lowing nearby. The machine in front of him no longer seemed strange now that he could see it properly. He’d seen such machines many times. They stood in the clearings between the sugar cane fields. The farmers transported the sugar cane to them in carts drawn by water buffalo, mules or donkeys. He looked down at the gears in the sugar cane crusher. He tried to kick, but his legs were tied. Just like his hands. He struggled, wriggling like a worm. The diesel motor that ran the crusher started with an ominous groan. Exhaust rose slowly from the low pipe, and a long, reddish conveyor belt was set in motion. The crushing rollers responded with a lurch. They were equipped with big, sharp steel teeth and rotated toward each other in order to firmly grip the sugar cane and feed it into the crusher, pressing out the sweet juice, while the stalks were crushed to dry fibers. His feet were less than a foot from the rotating rollers now. Every cell in his body froze with fear when he realized what they were planning to do. Two men appeared. A scruffy-looking commander and a bodyguard toting a Kalashnikov. The commander was wearing an Afghan cap and a shawl that he had pulled up over his face so that it covered everything except his dark eyes. He held up one hand half-heartedly, and the four men stopped. He went up close to the prisoner and spoke right into his ear. “Now, my friend,” he said calmly. “Do you have anything to tell us?” His voice was barely audible above the grating sound of the steel rollers. “Y-yes, yes . . .,” he gasped. “P-please . . .,” he tried to say. But all that could be heard through the bit was a hoarse gurgling, which couldn’t compete with the shrill screeching of the rollers. The commander nodded to the men carrying him, who responded by holding him even closer to the machine. He tensed the torn muscles of his legs in a last, desperate kick. It was no use. His feet were touching the steel rim now. Five more inches and his feet would be caught by the teeth of the rollers; he would be drawn into the crusher and all the juice would be pressed out of him. Suddenly his gag was loosened and, gasping for breath, he made a final, desperate plea. “We don’t have time for lies,” said the commander. “I will tell you everything. Please!” He was shouting now. The commander picked up a log the width of a man’s leg. He reached over and stuck it into the sugar cane crusher; the log was swallowed up with a crunching sound. Within a few seconds it had been ground to splinters. “So. What will you tell me?” asked the commander.